One of the tenets of modern gastronomy is simplicity: allowing good ingredients to take centre stage. Today’s recipes reveal the Georgians as the masters of this art. There are no lengthy lists of ingredients, complicated cooking processes or extravagant proposals for presentation. Instead, we are offered a masterclass in moderation, as even the cheapest meat and fish are given the space to shine on the plate. Take a lambs head & lights. Open the jaws of the head and wash them thoroughly. Put them in pot with some beef stock made with three quarts of water and two pounds of shin of beef strained. Boil very slowly for an hour. Wash and string two or three good handfuls of spinach. Put it in twenty minutes before serving. Add a little parsley & one or two onions a short time before it comes off the fire. Season with pepper & salt & serve in a tureen. Season yr herrings with pepper & salt. Put a good deal of sliced onion with then & good store of butter. 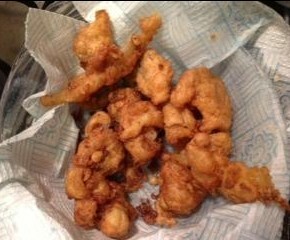 Soe bake them in puff paste & eat them hot. And finally, water souchy. The dish’s curious name comes from the Dutch waterzootje, and it seems possible that this soup may have become enshrined in the English culinary repertoire around the time of William of Orange’s accession to the throne in 1689. Today, the Belgians still enjoy a traditional fish stew known as waterzooi. Is made with flounders, whitings, gudgeons or eels. They must be quite fresh & nicely cleaned, for what they are boiled in makes the sauce. Wash, gut & trim your fish. Cut them into handsome pieces. Put them into a stewpan with as much water as will cover them, with some parsley, an onion minced, a little pepper & salt. Some add scraped horseradish and a bay leaf. Skim it carefully when it boils. When done enough, (which will be in a few minutes) send it up in a deep dish with bread sippets and some slices of bread & butter on a plate. Portable soup was the Regency equivalent of the modern-day stock cube. Break the bones of a leg or shin of beef, 10 lbs weight. Put it in a digester, cover it with cold water, set it on the fire to heat gradually till it nearly boils. This should be an hour. Skim carefully, pour in a little cold water to throw up the rest. Let it boil again and again. Skim carefully when it appears clear (put in neither roots, herbs nor salt). Let it boil for eight or ten hours and then strain into a brown stone pan. Set the broth where it will cool quickly. Put the meat into a sieve. Let it drain – make potted beef – next day remove every particle of fat from the top and pour it through a fine sieve, as quietly as possible, into a stewpan, taking care not to let any of the settlings go into the stewpan. Add a quarter of an ounce of whole black pepper. Let it boil briskly, uncovered, on a quick fire. Take off all scum when it begins to thicken & is reduced to about a quart. Put it in a smaller stewpan, set it over a gentle fire till reduced to the thickness of a very thick syrup. Take care it does not burn. Try a little out in a spoon. If it sets into jelly, it is done. If not, boil a little till it does. Have some little pots an inch & half deep. Take care they are quite dry. The ‘digester’ in which this jellied stock would have been prepared was a forerunner of today’s pressure cookers, and would have certainly helped to speed up the cooking down of the beef bones. Nevertheless, preparing portable soup was a laborious process. As it formed, the stock needed to be regularly skimmed of fat – the smallest amount could otherwise turn rancid over time and badly affect the taste of the finished product. Prepared with care and stored in a dry place, this kind of jellied bouillon could be kept for some time. When needed, the cubes would be quickly reconstituted into soup with the addition of boiling water, herbs and seasoning. Who needs Pot Noodle when you have portable soup? The sandwich is not an 18th century invention. People across the world had already been eating snacks of bread and cheese, or bread and meat, for many hundreds of years. But it was during the Georgian era that the sandwich gained its name and became a recognised dish in its own right. So what is the story of the sandwich? It starts in the mid 18th century with a piece of gossip about a Member of Parliament and his curious eating habits. 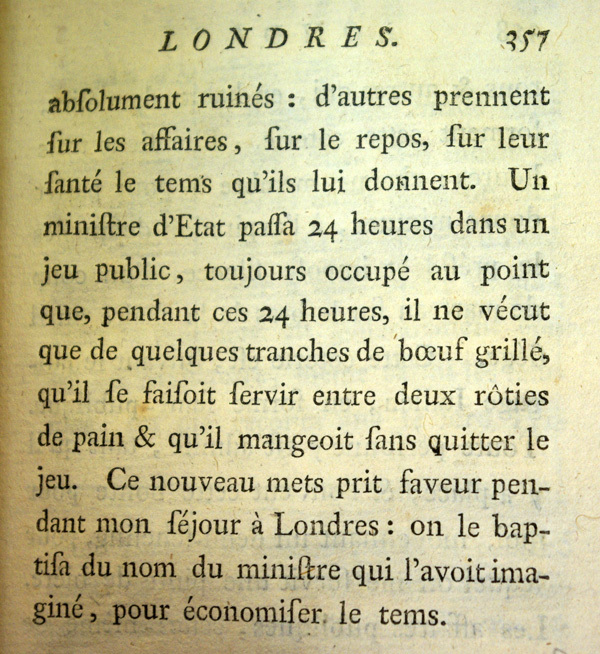 Extract from Pierre-Jean Grosley’s three volume work Londres gives one of the earliest references to the sandwich. A State minister spent 24 hours in a public gambling game, constantly occupied to the point that, during these 24 hours, he only lived off a few slices of grilled beef, which he had served to himself between two pieces of toasted bread, and which he ate without quitting the game. This new dish gained favour during my stay in London: it was christened the same name of the minister who had dreamt it up to save time. Grosely’s anonymous minister was none other than John Montagu, 4th Earl of Sandwich. Whether the rumour was true or not, it certainly gathered momentum very quickly. People began asking for their bread and meat ‘the same as Sandwich’ and soon the snack itself became known by the minister’s name. 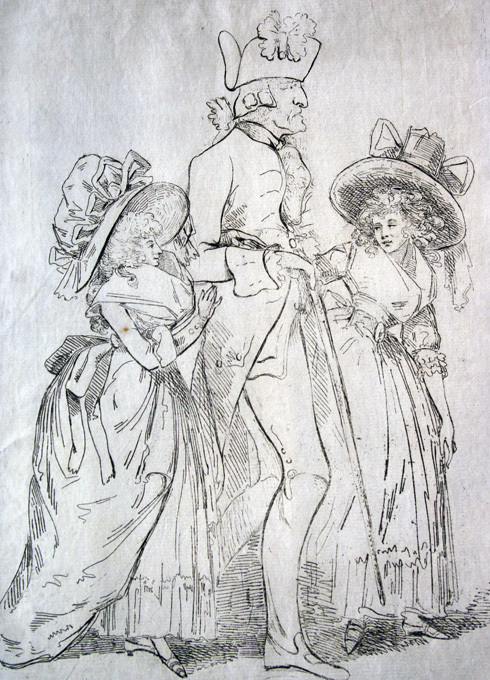 ‘A Sandwich’: an 18th century satirical cartoon. 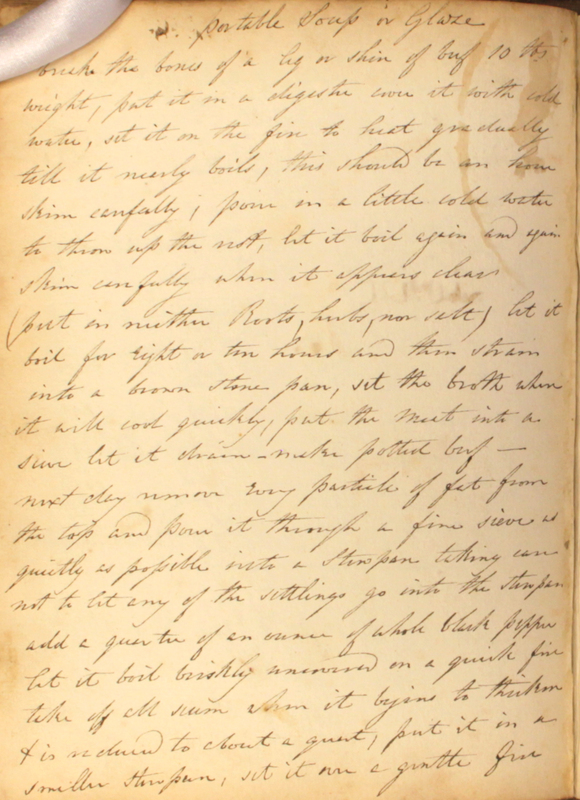 Ideas for sandwich fillings, transcribed in our Cookbook of Unknown Ladies from Kitchiner’s Cook’s Oracle. Cold meat or poultry, potted or savoury ditto, ditto cheese, or grated ham or tongue, German sausages, hard eggs pounded with butter and cheese. Mustard, pepper and salt as necessary. 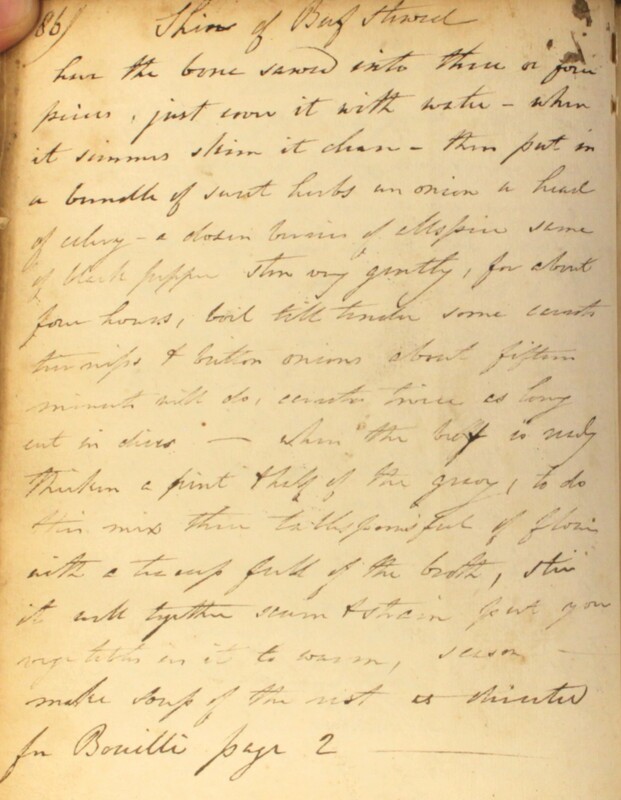 Despite the current culinary revival of using offal and cheap cuts of meat, there are some recipes in our Cookbook of Unknown Ladies which only the most adventurous of cooks are likely attempt today. Among these intrepid cooks is historical food expert Annie Gray, who gave nineteenth-century cow heels a try. This will furnish several good meals. When boiled tender, cut it into handsome pieces. Egg and bread crumb them, fry them a light brown, lay them round a dish and put in the middle sliced onions, fried. 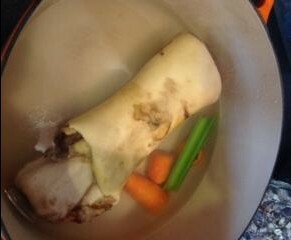 Annie boiled the cow’s heel with a little carrot and leek to add flavour to the stock. Once cooked, she chopped the heel into pieces and coated them in breadcrumbs before frying up the whole lot in a deep pan of oil. What did she make of them? Garlick vinegar, a tablespoonful – of mustard, brown sugar & black pepper, a teaspoonful each stirred into half a pint of oiled melted butter. Like many Georgian and Regency dishes, cow heel was highly economical to prepare. 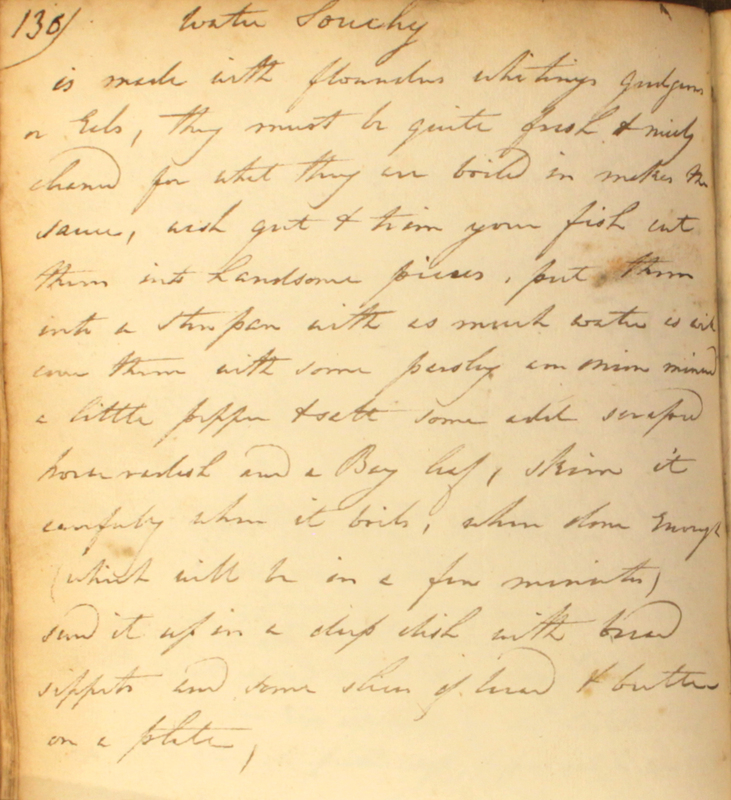 The stock formed when boiling the heel could be used to make jelly, and whole of the boiled heel could then be eaten, skin and all, with no waste. Let your feet be well boyled. 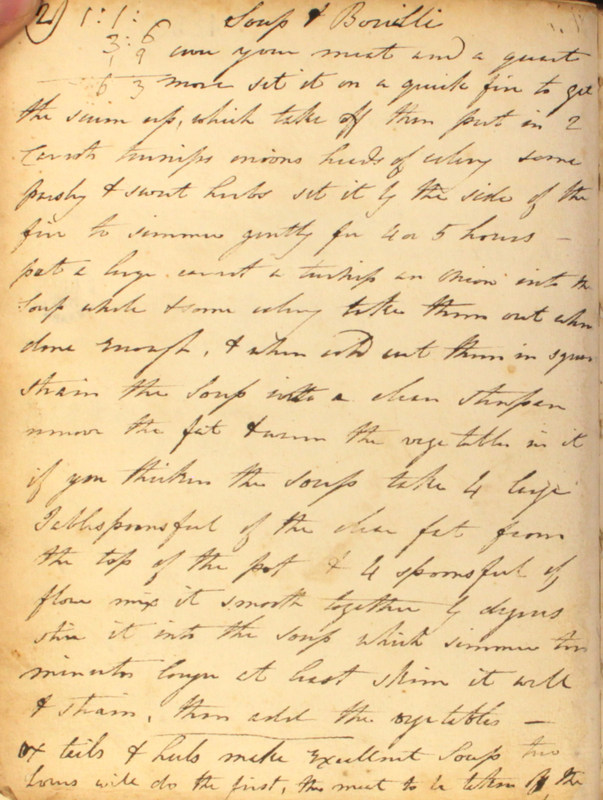 Take half a pound of them chopd small, half a pound of beef shuit, half a pound of currants, four eggs well beatten, some sugar, three or four spoonfulls of flower, salt, sack, brandy and nutmeg. Mix all to gether. An hour will boyle it. 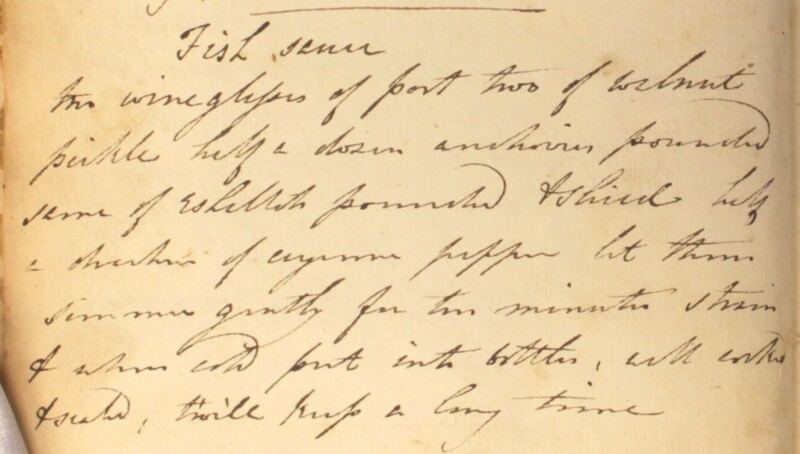 A selection of sauces for serving with fish, from our Cookbook of Unknown Ladies. The Cookbook features four rather hearty recipes for wine-based sauces, each with an injection of heat from horseradish, a spicy pickle or a touch of cayenne pepper. All but one use red wine or port as a base. These hot, rich and tangy sauces may threaten to overpower the modern palate, but they were served as typical accompaniment to white fish well into the 19th century. 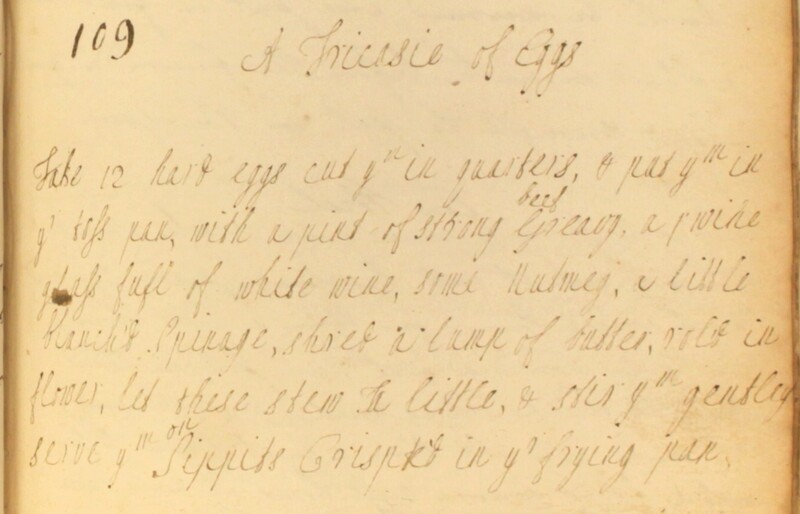 Set half a pint of claret on ye fire with an onion shred, a little grose [coarse] pepper, a shillat, 2 anchoves, a little horse reddish scrape’t. 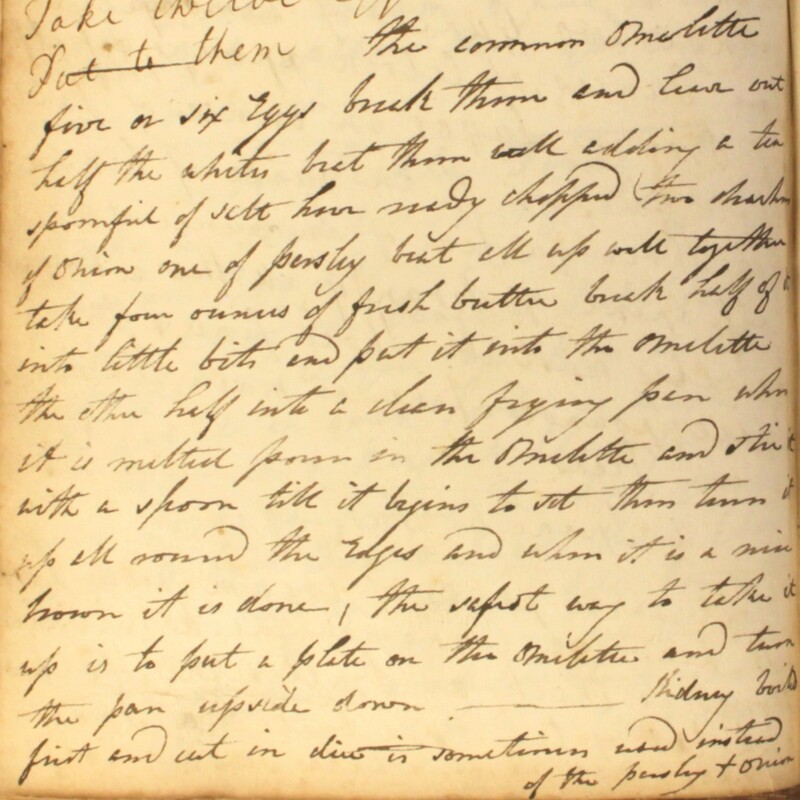 Let it boyle till you think it has ye strength of ye spice, dren draw a good deal of fresh butter & mix it with yr wine. So pour it on yr fish. Get some strong greavy, anchoves, shillot, nutmeg, & all spice. Set ym on ye fire together. Let ym stew a good while. 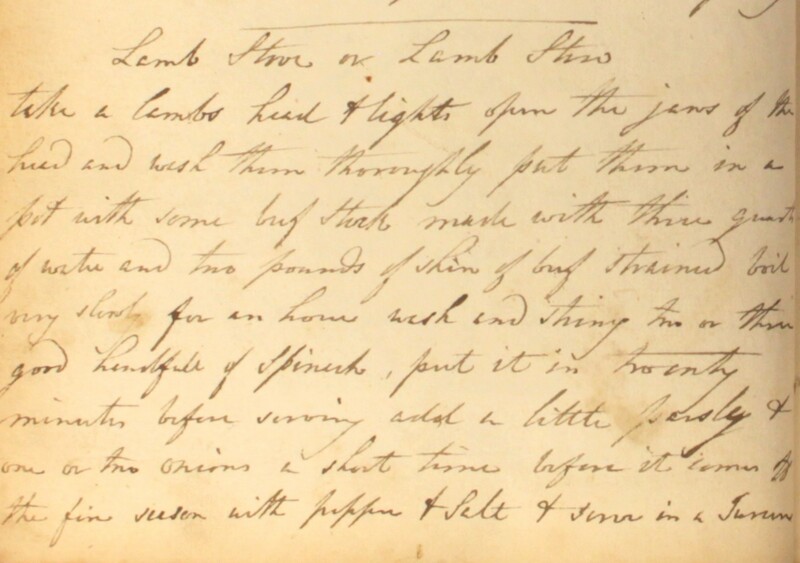 Then strain it & draw a good deal of fresh butter, very thick, a glass of claret or white wine, ye body & pea of a lobster, or body of a crab. Mix all together. So serve it wth pickles. The ‘pea of a lobster’ refers to the lobster’s coral, or egg sack. Take a print of butter and brown it. Shake some flower. Then, if you have oysters liquor or cockell liquor, pour it to it, if not, clean water. Then put in anchoves, a fagot of sweet herbs, parsley. Slice thin a lemond, scrap som horse reddish, put it into half a pint of white wine. Then put in a pound or more of butter and draw it up all to gether. Great nutmeg and put it into it. So pour it on. Two wineglasses of port, two of walnut pickle, half a dozen anchovies pounded, same of eshallots pounded & shied, a drachm of cayenne pepper. Let them simmer gently for ten minutes. Strain & when cold, put into bottles well corked & sealed. Twill keep a long time. As well as a glug or two of full-bodied wine, all these recipes have another ingredient in common: the humble anchovy. This little fish has long been employed by chefs to add ‘oomph’ to sauces, and is commonly eaten used around the world in bottled condiments such as Worcestershire sauce and nam pla (Thai fish sauce). In his latest TV series, Nigel Slater featured the anchovy as a ‘secret’ ingredient for a flavoursome sauces . Our Cookbook shows that the anchovy’s potential to transform a sauce was far from secret in the Georgian era.